The global climate turned even warmer by the early Eocene. Tropical type forests expanded further into the Arctic and Antarctic Circles, while seasonal forests thrived at the poles, a most unusual event in the globe's vegetational history. Many of the mammalian orders known today had their origins in the early Eocene. Even higher latitudes saw a proliferation of mammal types. Christine Janis speculates that a globe at its peak warming may have brought about a more phased distribution of rainfall over the year, forcing greater spacing of trees and encouraging undergrowth vegetation. This would have created niches for the evolution of ground-dwelling herbivores. The hoofed mammals, the even-toed artiodactyls (e.g., primitive deer), and the odd-toed perissodactyls (e.g., earliest horse) appeared at this time in addition to the true primates (lemurlike creatures). It is in the early to middle Eocene that several early proboscideans thrived. The best known of these is Moeritherium, a stocky, pig-size, and hippolike creature weighing about 125-250 kg; it lived in small, freshwater bodies or marshy habitat along the fringe of the ancient Tethys Sea. Its remains were first discovered about a century ago in the Fayum Basin of Egypt, but fossils were also later recovered from a wider area in northern Africa. The dental characters of Moeritherium clearly indicate an animal that was a proboscidean archetype. It had six cheek teeth on either side of the upper and lower jaws. The molars were low crowned with simple cusps, a primitive condition known as bunolophodont. The second upper and lower incisor teeth protruded into the upper and lower jaws; these were clearly incipient tusks. The skull features suggest that even a short trunk was not present, although one moerithere (M. lyonsi) may have had a thick upper lip. The moeritheres were clearly specialized to feed on soft aquatic vegetation. The 1984 discovery from early Eocene deposits in Algeria of a creature named Numidotherium koholense displaced the moeritheres as the oldest Eocene proboscideans. This creature stood 1-1.5 m tall. Its elevated skull with elevated external naris suggests that it had a short proboscis, rather like that of a tapir. Its teeth characters are closer to those of the older Phosphatherium (the former having larger teeth) than to the moeritheres. Based on the pattern of wear on the first premolar in the lower jaw, Nick Court has argued that Numi-dotherium specialized in stripping leaves from branches at head height or above. Such a diet is not consistent with the common assumption of a brackish water existence for the early proboscideans. Before the end of the Eocene, another creature appeared, the enigmatic Barytherium, now recognized as a full-fledged proboscidean. Fossil remains of the barytheres go back to the Fayum site in Egypt, although they have also been discovered elsewhere in northern Africa. Barytherium grave from the Egyptian site seems to have already reached the size of a modern elephant, while another species from Libya resembled a moerithere in size. The upper jaw shows a large pair of lateral incisors (clearly "tusks"), while the molars were bilophodont (cusps arranged in pairs). Although Barytherium is not considered a mainstream proboscidean, it is considered to be related to another puzzling proboscidean—Deinotherium—which appeared at a later stage, along an evolutionary branch that was to reach a dead end after a very long run. An African origin for the proboscideans was seriously challenged by the discovery of the anthracobunids from older Eocene rocks in the northwestern Indian subcontinent. Five genera (Anthracobune, Ishatherium, Jozaria, Lammid-hania, and Pilgrimella) have been described from sites in Pakistan and India. The dentition of the anthracobunids is relatively unspecialized, with a full complement of teeth that included three incisors, one canine, four premolars, and three molars on either side of the upper and lower jaws. Pilgrimella was the size of a river hog, with a weight of about 125 kg. These unspecialized mammals lived in brackish water and clearly fed on soft vegetation in aquatic habitats. There has been much debate on whether the anthracobunids are proboscideans. The present view, strengthened by the cladistic analysis of Pascal Tassy, is that these are indeed proboscideans. The Eocene fossil record thus reveals a diverse assemblage of mammals, several of them with proboscidean affinities, inhabiting a wide area in semi-aquatic habitats along the borders of the ancient Tethys Sea. This extended far beyond the limits of the present-day Mediterranean Sea. 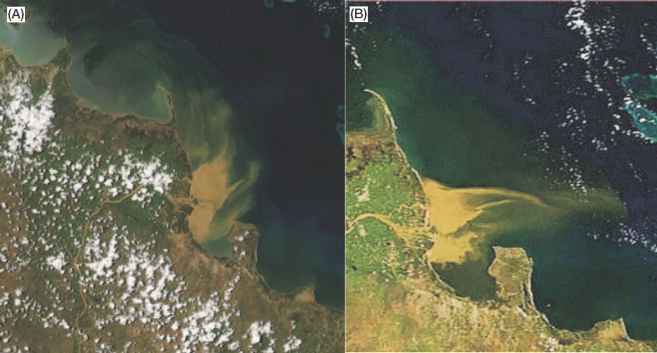 The habitats of the anthracobunids, moeritheres, barytheres, and Numidotherium are very similar— shallow, muddy water environments along fluctuating shorelines. This is consistent with the warm, moist world of the Eocene. Both the Asian and African fossil sites contain numerous marine invertebrates and vertebrates, confirming the proximity of the ocean to the inland proboscidean habitats. Among these early, primitive proboscideans, we already see a specialization of dental characters from a full complement of teeth, to lost canines and premolars, enlarged incisors, and molars with increased lophs. Considerable increase in body size is also in evidence (one barythere was already the size of a modern elephant). What evolutionary pressures could have driven these changes in the Eocene proboscideans? Although the early-to-middle Eocene represented a peak warming period, the world grew cooler and drier, especially at higher latitudes, between the middle and late Eocene. The lush, tropical kind of vegetation began its retreat in the face of increased dryness and season-ality (remember that such descriptions are all relative; the world was much warmer and wetter than more recent epochs). On a regional scale, even the lower latitudes could have experienced some aridity, creating drier types of vegetation and newer niches to exploit. Larger herbivorous mammals evolved with more prominently ridged (or lophed) teeth to deal with coarser plant forage. Larger body size is partly a response to the nutritional needs for processing greater quantities of lower quality vegetation. The elephantlike size of Barytherium grave cannot be explained by a need for immunity from predators; there were no large carnivores during the Eocene. Rather, it can be explained by the changing vegetation, which made it necessary for a herbivore to consume the vegetation at higher rates. Although Barytherium fossils are associated with aquatic habitats and its anatomy certainly suggests life in swampy ground, it is also reasonable to think that this creature obtained substantial quantities of its forage from drier woodlands on more firm ground. Interestingly, all of these Eocene proboscidean genera are now believed to be somewhat removed from the direct ancestry of present-day elephants. Even Moeritherium, long considered an ancestor, was possibly too specialized in certain skull and dental characters to be the ancestral stock of all latter-day proboscideans.